I'm from Germany and i'm using the Tenfourbird 38.3.0 for PowerPC 7450 (with German-Langpack on a Silver G4 with OS X 10.4.11). Did you know the problem or is it unique on my mac? Is there any solution/patch for the error? It look like XUL cache problem. So Resetting XUL cache may help you. Could you try the following steps? 4. Set it to true. 6. Open the Config Editor. > I'm from Germany and i'm using the Tenfourbird 38.3.0 for PowerPC 7450 (with German-Langpack on a Silver G4 with OS X 10.4.11). > Did you know the problem or is it unique on my mac? Is there any solution/patch for the error? Thank you for the quick help and the solution-trick. I followed the steps you have written, but the error-message is also there. > It look like XUL cache problem. So Resetting XUL cache may help you. > Could you try the following steps? > 4. Set it to true. > 6. Open the Config Editor. > > I'm from Germany and i'm using the Tenfourbird 38.3.0 for PowerPC 7450 (with German-Langpack on a Silver G4 with OS X 10.4.11). > > Did you know the problem or is it unique on my mac? Is there any solution/patch for the error? Umm... Can you try the following procedure? > Thank you for the quick help and the solution-trick. > I followed the steps you have written, but the error-message is also there. Now, I can reproduce this bug! I'm trying to figure out where is the cause of this bug. You can prevent this error in en-US locale. > > Thank you for reporting the issue. > > It look like XUL cache problem. So Resetting XUL cache may help you. > > Could you try the following steps? > > 4. Set it to true. > > 5. Restart Tenfourbird. > > 6. Open the Config Editor. 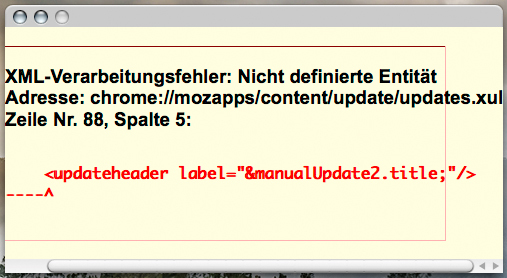 > > > I'm from Germany and i'm using the Tenfourbird 38.3.0 for PowerPC 7450 (with German-Langpack on a Silver G4 with OS X 10.4.11). > > > Did you know the problem or is it unique on my mac? Is there any solution/patch for the error? Bugfixed langpacks (38.4.0) are released. Autoupdate of new langpacks are started in few days. メッセージ #77160 への返信 > Bugfixed langpacks (38.4.0) are released. > https://osdn.jp/projects/tenfourbird/releases/64020 > > Cause of this bug is that I did forget apply one patch :-< > > Autoupdate of new langpacks are started in few days. > > Regards. > Bugfixed langpacks (38.4.0) are released. > Autoupdate of new langpacks are started in few days. メッセージ #77191 への返信 > Great! > > Thank you for the quick help. > > Greetings from Germany > Jens > > [Reply To Message #77160] > > Bugfixed langpacks (38.4.0) are released. > > https://osdn.jp/projects/tenfourbird/releases/64020 > > > > Cause of this bug is that I did forget apply one patch :-< > > > > Autoupdate of new langpacks are started in few days. > > > > Regards.